Location, Location, Location. The Super 8 property is conveniently located off of Exit 193 on I-35. The easy on/off access ramp makes this property THE place to stay in Clear Lake Iowa. The new addition of the Kum and Go convenience station makes it even more desirable. We boast 60 well-appointed guest rooms, all of which feature free wireless high speed internet, coffee maker and hair dryer. 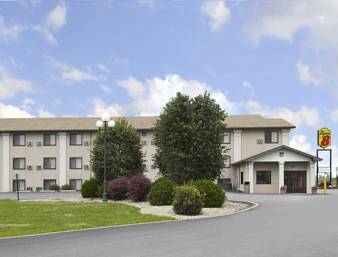 Enjoy one of our single rooms which include all of the standard amenities plus a recliner and additional living space. Complimentary Happy Hour from 5-7pm every night for all guests. Breakfast hours are weekdays 5am-9am. The city comes alive during the first weekend in February as the annual Buddy Holly Memorial weekend gets underway. Make your reservations early for this popular event. Events are held at the famous Surf Ballroom, the last place Buddy Holly, the Big Bopper and Ritchie Valens played to a packed house. Our staff is always ready to handle your hotel travel needs. We look forward to serving you. We will see you along the way. Pet fee 10 dollars per pet. ~73 miles from Clear Lake. ~76 miles from Clear Lake. ~79 miles from Clear Lake.